A recent survey found that over 63 percent of adults in the U.S. are either overweight or obese. Most people know that diet and exercise can get the body back to normal shape, but diet and fitness plans generally do not discuss the mechanisms by which diets work. The weight of the body is regulated by the digestive system, the respiratory system, and hormones from the pancreas. Food provides proteins, fats and carbohydrates which are macronutrients absorbed by the digestive system and are used to build body tissues and provide energy. The presence of carbohydrates in the blood causes the beta cells of the islets of Langerhans in the pancreas to release insulin. Insulin is a hormone that regulates carbohydrate metabolism and causes cells to take up glucose from the blood and store it as glycogen in the liver and as fat in the skin, abdomen, hips and muscles. The islets of Langerhans in the pancreas also have alpha cells that produce glucagon, a hormone that helps convert stored fat into carbohydrates, but the secretion of glucagon is inhibited by the presence of insulin. 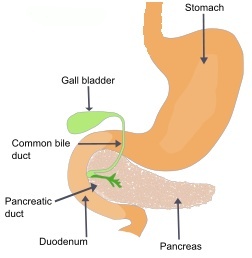 Thus, the hormones secreted by the pancreas control the level of glucose in the body. When we eat food, insulin reduces the level of sugar in the blood by converting it mostly to fat. When we are hungry, glucagon raises the level of glucose in the blood by converting fat into carbohydrates through lipolysis. When we lose weight, where does the lost body weight go? Energy is extracted from the nutrients by the mitochondria in the cells. The waste products are carbon dioxide, uric acid and ammonia. These last two are nitrogen-containing compounds. Uric acid is the result of oxidation of nucleic acids found in the DNA of the food that we eat, and ammonia is produced from the metabolism of proteins. The liver combines ammonia and carbon dioxide into urea, and both, uric acid and urea are excreted in the urine, which is how the body removes waste nitrogen from the body. The excess carbon dioxide from carbohydrate and fat metabolism is expelled through the lungs which also take into the body oxygen from the atmosphere. So, the weight is lost through the urine produced by the kidneys and through the carbon dioxide exhaled by the lungs. Exercise increases the rate of metabolism and promotes the breakdown of body tissues to produce waste products. Every exhalation of breath carries some carbon dioxide that reduces the body weight by a corresponding amount, which is not very much. One hour of exercise, such as walking at a brisk pace, burns 300 calories; this corresponds approximately to the calories in one bagel with a tablespoon of jelly. The combination of exercise and a nutritious, limited calorie diet is crucial for weight reduction. Exercising in the fasted state before breakfast improves insulin sensitivity and takes advantage of the fact that carbohydrate stores are burned during the night and the body switches to burning fat. Exercise before eating maintains the fat-burning mode, and this can be extended by delaying breakfast for one hour after exercising. It is important not to snack. Even a small morsel of food can trigger the release of insulin and stop the fat-burning mode.